This second part of our blog series on solar water pumping. 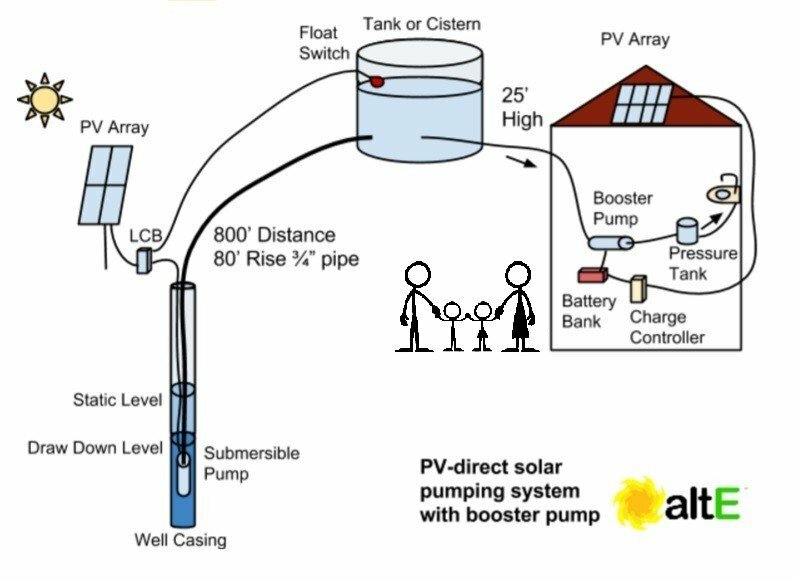 Be sure to read “Solar Water Pumping – Part 1” first to get a background on water solar water pumps are and what are common options. This blog posting will covering solar pumping systems where you are drawing water from a well and not where the source of the water is a pond, lake, river etc. These shallow pumping sources will be covered in a future blog posting where one would use a surface pump powered by solar. When determining what pump(s) to get, you need to evaluate your pumping needs. How much water a day do you need, how many days of storage, how high and far does it need to be pumped, and what is the source? Seventy five Gallons per day (GPD) per person is common for domestic use. Your local weather patterns will help determine the amount of storage; do you have long stretches without sun, or is it only an occasional cloudy day? Let’s use an example of a family of 4 in Ohio to supply their off-grid house with domestic water. They need to store enough water for a week of bad weather. They have a well 800ft away from the house, running through ¾in plastic pipe. The cistern is 80ft higher than the water level, and 25ft higher than the house. A solar water pumping system that includes a submesible solar pump and a booster pump to increase water pressure for household use. Pumping Rate: How many gallons per minute will the pump need to move water when it’s powered by the sun? Effective Dynamic Head: How high, vertically, will the pump have to move the water up? Plus, how much effective head is added due to friction loss in the pipe? We know that the pump has to raise the water vertically 80 feet. But it also needs to push it 800 feet horizontally. Even if the 800ft is completely horizontal, there will be friction loss from flowing through the pipe. The rate of flow will determine how much Friction Head Loss you will get. Friction head loss is a way to take into account the friction of the water moving through the pipe and incorporate the additional load on the pump as if it were part of the vertical pumping distance (i.e. dynamic head) the pump has to get the water up to. Fortunately, there are handy tables that can tell us how much effective dynamic head we have to add due to every foot of pipe for different pipe sizes and rates of pumping the water through them. In the chart below, each 100’ of pipe length will be equal to the corresponding number of vertical feet of head. In our example, ¾in pipe flowing 2GPM though it will be equal to 1ft vertical head per 100ft. So 800ft of horizontal pumping will equal 8 additional feet of head, for a total of 88ft of head (80ft of actual vertical head + 8ft friction head loss). So we now know that this family in Ohio will need a submersible pump that is capable of pumping at least 1.11 GPM and up 88ft of head. With just those two pieces of data we can go and drill down to any of the submersible solar pumps specification pages and there will be a chart for each pump that will tell us what each model can do for that pump rate (some will be in GPM, others will show an hourly GPH) and dynamic head. We then just need to narrow down which one will do at least as much pumping in GPM as we will need for a total of 88ft of dynamic head. Without scrolling beyond the bottom of the graph below, can you figure out which pump(s) will provide us with at least 1.11GPM at 88ft of head? Note that the total feet of head is along the bottom of the chart (meters is along the top). 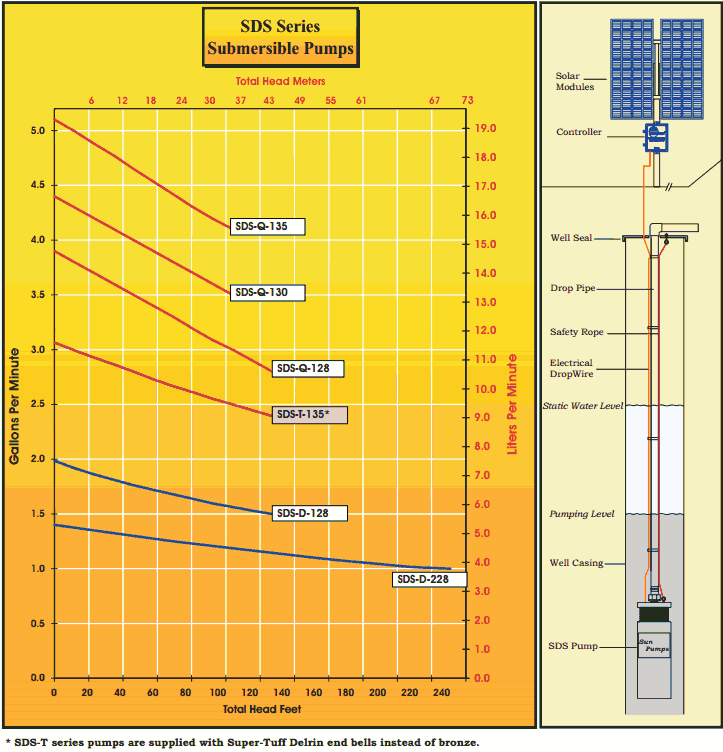 An example of a typical chart for a submersible solar pump, where it shows us 6 different pump models and what they can do for gallons per minute with a given total head height. Starting at the bottom of the graph, the Sunpump SDS-D-228 can pump about 1.2 GPM at 88’. That’s a bit close for our needs, let’s see what the next size up is. The SDS-D-128 can pump over 1.5GPM at 88ft. Over 360 minutes, that would be 540 gallons. We determined we needed 300 gallons a day, so that gives us a nice buffer for bad weather. 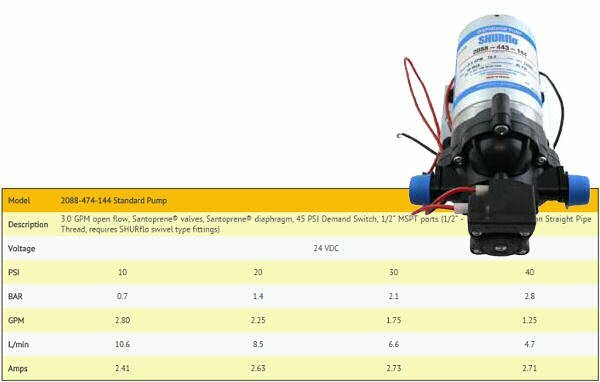 At this point we could also look at other submersible pumps options, like those from Shurflo or SunRotor, but we will run with SunPumps SDS-D-128 model for now as the example. Once you have figured which models of pumps could work for our application the next step is to figure out how many watts of solar panels we will need to power the pump and ensure it provides us with the water we need. 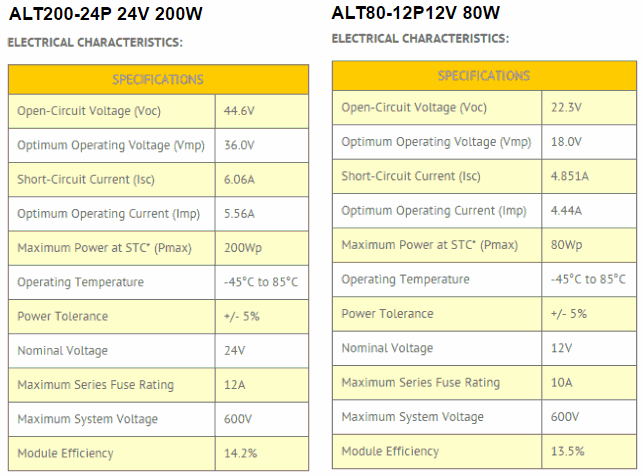 To find the SDS-S-128’s power requirements we got to the table within the detailed specification page on altE’s website. A general rule of thumb is to oversize the solar panel by about 30% to make up for less than ideal weather conditions. We see in the chart below that at 92ft (close to our target 88ft) Total Dynamic Head (TDH feet), it can pump 1.55GPM, which confirms what we saw in the previous graph. 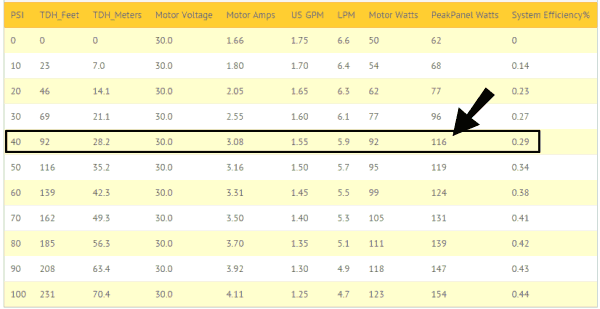 With the motor at 30 volts DC, it recommends at least a solar panel of 116 watts (W). Since a nominal 24V solar panel has a Vmp (i.e. Maximum Power Voltage is what voltage at which panel produces the most power) of about 36V, we can either use a single 24V nominal solar panel or two 12V panels wired in series would work. We could use one altE 24V 200W panel, or two 12V solar panels that are half the wattage, like the altE 12V 80W solar panels in series for 24V nominal 160W total. A single altE 200W 24V nominal solar panel could be used or two altE 80W, 12V nominal solar panels. 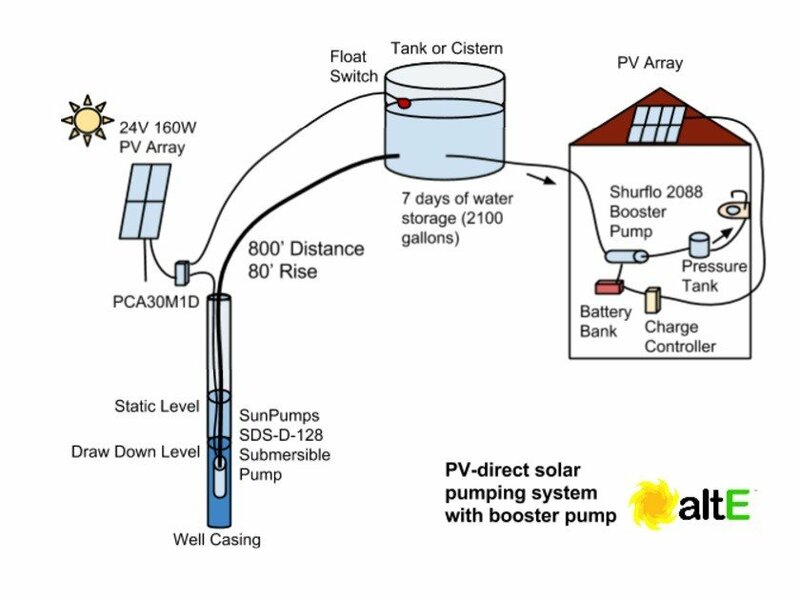 To optimize the amount water you can pump in a day it is important to use a pump controller, which are often referred to as a Linear Current Booster (mentioned in Part 1 of this solar water pumping series). The controller will get your pump to turn on earlier in the morning and stay on later into the day. Each manufacturer has a pump controller they recommend for their series of pumps but there are a number of other linear current boosters that are from other manufacturers that provide other features that may work with the pump you choose, such as a float switch or water level switch. In this example, the SDS series pumps use the SunPump PCA 30-M1D Pump Controller. With only 25ft of head (vertical distance) from the cistern to the house, you will get 25ft x .433 PSI/ft = 10 PSI of water pressure from gravity feed, so a booster pump will also be needed to maintain house water pressure. The Booster pump would be connected to the battery bank to allow you to have house pressure whenever needed, not just when the sun is shining. Pumps that are specifically made to be booster pumps to pressurize water can be used but surface pumps can also be used in this application. The Shurflo 2088 is available for a 12V or 24V battery bank, and provides up to 40PSI pressure, runs at around 2GPM and consumes about 65W when running (from the graph below we take 24V DC x 2.71A = 65W) . If the pump only runs one hour a day, that is only 65 watt hours (Wh) a day. 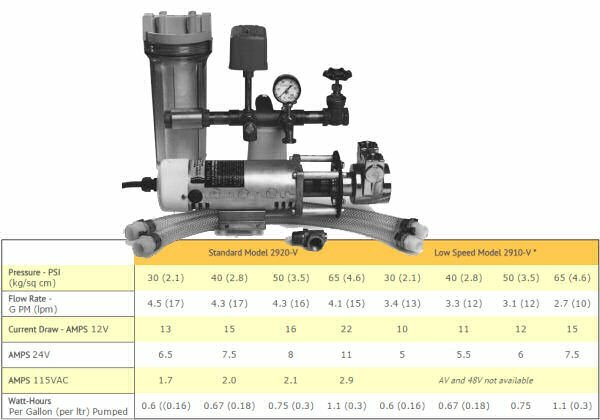 Chart for the 24V DC version of Shurflow 2088 surface pump which can be used to pressurize a home’s water lines. The Dankoff Standard Speed Flowlight Booster Pump (which has various voltage options) can pressurize your home’s water up to 65PSI, and at 40PSI moves water at 4.3GPM while using about 180 watts when run at 24V DC. The Dankoff Flowlight series of booster pumps is specifically made for pressurizing household water. A pressure tank, which can be purchased locally, is typically charged by the pressurizing pump. The larger the tank is the less the pump has to turn off and on. Typically the batteries for pressurizing pump system would be the same one as the off-grid household’s battery bank. However, if your application is one where you are going to have a battery bank dedicated just to this pressurizing pump you can treat sizing this system like sizing a small off-grid solar powered system. We recommend using our off-grid solar sizing calculator to determine how large of a battery bank, how many watts of solar panels and what size solar charge controller you would need. Your load (in watt-hours) for the system will be the power it consumes (i.e. multiply the pumps running voltage times its current, Amps, to get the watts) times the number of hours it would run total in a day. You’ll feed that information into the calculator. Typically you would connect the output of the pressurizing pump into pressure tank. The larger the pressure tank is, the less that pump has to turn off and on, increasing the life of the pump, reducing the sound from it cycling and, importantly, the more efficiently it runs – using less energy from your batteries. 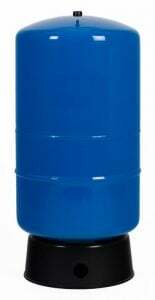 Typical sizes for the pressure tank ranges from 20 gallons to 100 gallons or larger. A larger tank can also supply pressurized water longer in the case that your batteries powering the pump get too low or the pump has to be pulled due to maintenance. A pressure tank can be skimped on but expect the pressure of your water to surge up and down as you use it, and if your flow rate is more than water the pump can produce in the moment you may never see the full pressure desired. 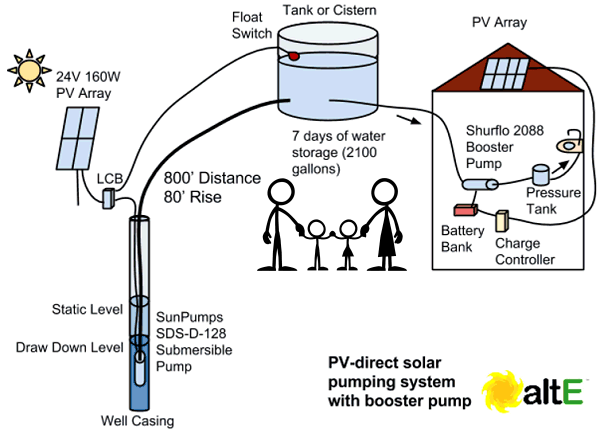 The drawing below shows the solar water pumping solution for our domestic water use example. Please contact us at the altE Store to help you find the right solution for your water pumping needs. Solar Water Pumping: Do I really need a control box? there is a mistake in using 12v 80 watts pannels. you would need 4 panels not the 2 in the article. The way we calculated it was it said the pump needed at least 116W or 3.08A at 24V. If I oversize the array by 30%, that’s 150W or 4A. Wiring two of the 12V 80W panels in series, we get 24V, 160W, and 4.4A, so two is enough.